Yahoo search background infected.Not sure is virus, spyware or malware. 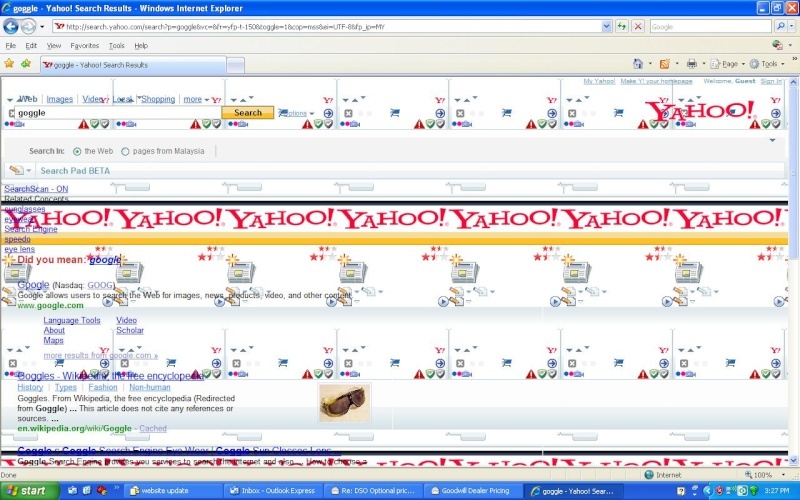 description Yahoo search background infected.Not sure is virus, spyware or malware. After i accidentally click a link in an email, my yahoo search result's background is infected.Below is the infected page and my hijack log file.thank you. description Re: Yahoo search background infected.Not sure is virus, spyware or malware. When Hijack This opens, click "Open the Misc Tools section"
Then select "Open Uninstall Manager"
thanks for the reply. Below is the copy that u mentioned. Do u have any idea what actually happen? Go to Start > Control Panel > Add/Remove Programs and remove the following programs. C:\WINDOWS\KBPK080620.log (Malware.Trace) -> Quarantined and deleted successfully. C:\WINDOWS\KBPK080627.log (Malware.Trace) -> Quarantined and deleted successfully. C:\WINDOWS\KBPK080704.log (Malware.Trace) -> Quarantined and deleted successfully. C:\WINDOWS\KBPK080711.log (Malware.Trace) -> Quarantined and deleted successfully. C:\WINDOWS\KBPK080718.log (Malware.Trace) -> Quarantined and deleted successfully. C:\WINDOWS\KBPK080801.log (Malware.Trace) -> Quarantined and deleted successfully. C:\WINDOWS\KBPK080905.log (Malware.Trace) -> Quarantined and deleted successfully. C:\WINDOWS\KBPK080912.log (Malware.Trace) -> Quarantined and deleted successfully. C:\WINDOWS\KBPK080919.log (Malware.Trace) -> Quarantined and deleted successfully. C:\WINDOWS\KBPK081005.log (Malware.Trace) -> Quarantined and deleted successfully. C:\WINDOWS\KBPK081011.log (Malware.Trace) -> Quarantined and deleted successfully. C:\WINDOWS\KBPK081024.log (Malware.Trace) -> Quarantined and deleted successfully. C:\WINDOWS\KBPK081107.log (Malware.Trace) -> Quarantined and deleted successfully. C:\WINDOWS\KBPK081112.log (Malware.Trace) -> Quarantined and deleted successfully. C:\WINDOWS\KBPK081114.log (Malware.Trace) -> Quarantined and deleted successfully. C:\WINDOWS\KBPK081122.log (Malware.Trace) -> Quarantined and deleted successfully. C:\WINDOWS\KBPK081129.log (Malware.Trace) -> Quarantined and deleted successfully. C:\WINDOWS\KBPK081203.log (Malware.Trace) -> Quarantined and deleted successfully. C:\WINDOWS\KBPK081206.log (Malware.Trace) -> Quarantined and deleted successfully. C:\WINDOWS\KBPK081212.log (Malware.Trace) -> Quarantined and deleted successfully. C:\WINDOWS\KBPK081219.log (Malware.Trace) -> Quarantined and deleted successfully. C:\WINDOWS\KBPK081223.log (Malware.Trace) -> Quarantined and deleted successfully. C:\WINDOWS\KBPK081226.log (Malware.Trace) -> Quarantined and deleted successfully. C:\WINDOWS\KBPK090103.log (Malware.Trace) -> Quarantined and deleted successfully. C:\WINDOWS\KBPK090110.log (Malware.Trace) -> Quarantined and deleted successfully. C:\WINDOWS\KBPK090123.log (Malware.Trace) -> Quarantined and deleted successfully. C:\WINDOWS\KBPK090131.log (Malware.Trace) -> Quarantined and deleted successfully. C:\WINDOWS\KBPK090206.log (Malware.Trace) -> Quarantined and deleted successfully. C:\WINDOWS\KBPK090213.log (Malware.Trace) -> Quarantined and deleted successfully. C:\WINDOWS\KBPK090220.log (Malware.Trace) -> Quarantined and deleted successfully. C:\WINDOWS\KBPK090307.log (Malware.Trace) -> Quarantined and deleted successfully. C:\WINDOWS\KBPK090313.log (Malware.Trace) -> Quarantined and deleted successfully. C:\WINDOWS\KBPK090403.log (Malware.Trace) -> Quarantined and deleted successfully. C:\WINDOWS\KBPK090411.log (Malware.Trace) -> Quarantined and deleted successfully. C:\WINDOWS\KBPK090417.log (Malware.Trace) -> Quarantined and deleted successfully. C:\WINDOWS\KBPK090424.log (Malware.Trace) -> Quarantined and deleted successfully. C:\WINDOWS\KBPK090430.log (Malware.Trace) -> Quarantined and deleted successfully. C:\WINDOWS\KBPK090502.log (Malware.Trace) -> Quarantined and deleted successfully. C:\WINDOWS\KBPK090515.log (Malware.Trace) -> Quarantined and deleted successfully. C:\WINDOWS\KBPK090522.log (Malware.Trace) -> Quarantined and deleted successfully. C:\WINDOWS\KBPK090613.log (Malware.Trace) -> Quarantined and deleted successfully. C:\WINDOWS\KBPK090615.log (Malware.Trace) -> Quarantined and deleted successfully. 3. It is important you rename Combofix during the download, but not after. 4. Please do not rename Combofix to other names, but only to the one indicated. 5. Close any open browsers. 6. Close/disable all anti virus and anti malware programs so they do not interfere with the running of ComboFix. We need to disable your local AV (Anti-virus) before running Combofix. See HERE for how to disable your AV. ComboFix will check to see if the Microsoft Windows Recovery Console is installed. **Please note: If the Microsoft Windows Recovery Console is already installed, ComboFix will automatically proceed with its scan. The Recovery Console provides a recovery/repair mode should a problem occur during a Combofix run. Allow ComboFix to download the Recovery Console. The Recovery Console will be installed. Do not mouseclick combofix's window whilst it's running. That may cause it to stall.